I find it’s common for students (of all ages) to say ‘they know something’. I’m fond of challenging them with three questions. This question is designed to help them to reflect and evaluate what exactly they know and where they got their information. The typical student response is usually one of two answers: (1) “I did X” (where X is: the assignments, the units, the chapter, etc. or, (2) “I got an A on the test!” = school tasks. Neither of these is a sufficient evaluation of learning, for me. In my opinion, the ultimate goal for school and teaching is to foster an educated populace. But what does that mean? I strongly agree that critical thinking is important. But simply, critical thinking cannot occur in the absence of HIGHER ORDER THINKING SKILLS. Memorizing a bunch of facts (Knowledge) is not going to develop critical thinking. 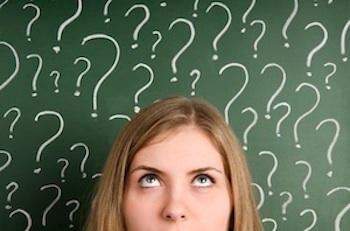 Memorizing a bunch of facts (Knowledge) is not going to develop critical thinking students. Students should be confident in their learnings and willing to argue because they have a personal toolbox– or repository of reasonings, evaluations, experiences, and justifications. If you’re a “critical thinker” and not willing to step-up and challenge others intellectually, what good is it? The critical thinking muscle is strengthened when it wrestles with new, different, and competing data, information, and ideas. Gathering new and different information and either modifying one’s own views or strengthening existing ideas, is part of growing and the continuous learning process we should want in anybody. These public displays can be shared easily with links, integrate collaboration, modified, and used as in learning portfolios over time. 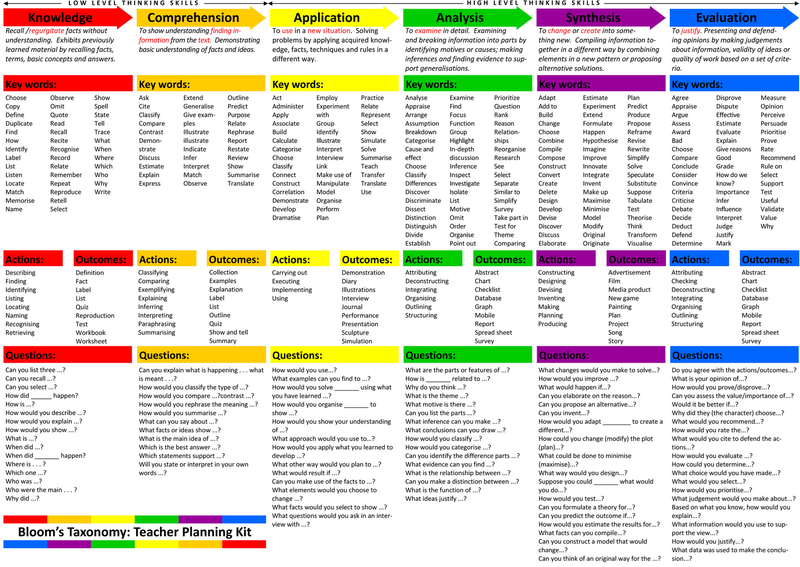 Bloom’s Taxonomy is a framework that helps teachers categorize educational objectives and increase the rigor of their questions to deepen understanding. The key is to move students from lower levels of factual recall to levels of higher thinking and understanding. graphic that helps guide teaching and learning for higher-order thinking. 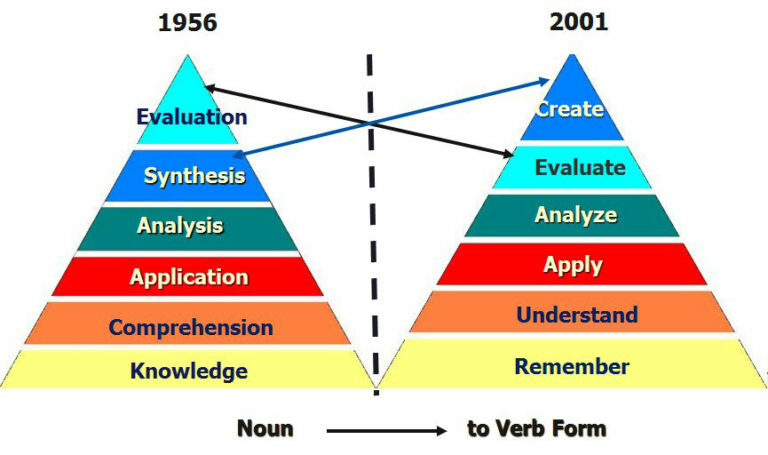 The following image includes the original taxonomy of cognition (1956) next to its revised version (2001). This original taxonomy by psychologist Benjamin Bloom is 60 years old. 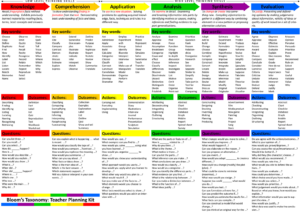 The taxonomy on the right is the recent adaptation and redefined work of Bloom in 2000-01, by Lorin Anderson and David Krathwohl. The revision included people with expertise in the areas of cognitive psychology, curriculum and instruction, and educational testing, measurement, and assessment. The revision included people with expertise in the areas of cognitive psychology, curriculum and instruction, and educational testing, measurement, and assessment. In conclusion, develop higher thinking skills and help move students from “this is what I did” to be able to explain what they learned and why it’s important.